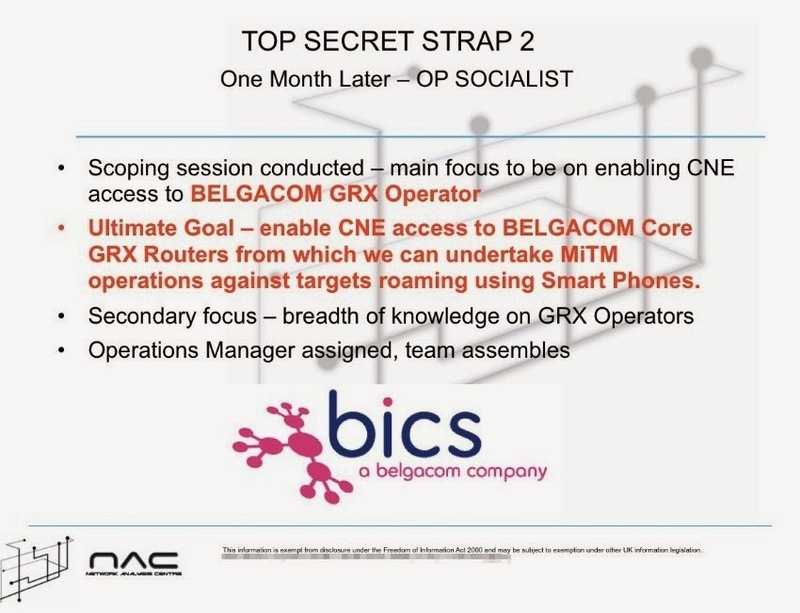 UPDATE 2018-09-20: according to Belgian news paper De Tijd, a new confidential report by the Belgian public prosecutor delivered to the Belgian government contains new clues pointing to GCHQ’s involvement in the Belgacom hack. The public prosecutor investigated a link to a computer in Indonesia, and when asking for information about its IP address, had learned that the British government had also asked questions about it. Furthermore, computers traced to other countries could be linked to the U.K., because some had been paid using anonymous prepaid payment cards that had been bought in the U.K. And lastly, when computer specialists were able to secure a copy of the malware back in 2013, it was found to contain names like `Daredevil’ and `Warriorpride’; from documents leaked via Snowden it is apparent that these names can be linked to CNE activities by GCHQ and the NSA. UPDATE 2013-12-04: Flemish newspaper De Tijd reports (in Dutch) that Belgacom is still struggling to control the remains of the malicious spyware at BICS. The remaining malware is said to be “so complex” that it baffles experts. 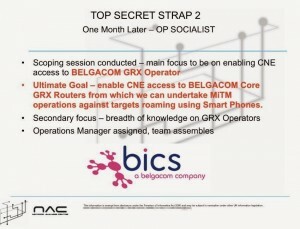 UPDATE 2013-11-10: here are a few Snowden-slides from GCHQ that mention Belgacom (click to enlarge). Der Spiegel reported (in English) that GCHQ used fake, malicious LinkedIn and Slashdot sites to lure Belgacom engineers and get malware on their computers to obtain access to a GPRS roaming exchange (GRX) router system operated by Belgacom-subsidiary BICS. UPDATE 2013-09-27: The Belgacom compromise reinforces the correctness of the “Two Axioms for the Information Age” (I don’t know who first coined these): 1) Any device with software-defined behaviour can be tricked into doing things its creators did not intend; 2) Any device connected to a network of any sort, in any way, can be compromised by an external party. Here is a careful English translation of this original article by Peter De Lobel and Nikolas Vanhecke in Belgian news paper De Standaard. Hyperlinks and parts in  are mine. Ping. It’s Friday the 13th. Around 11 o’clock in the morning, the IT consultants that Belgacom employs at its largest customers in the private and public sector receive a message. The message doesn’t say much, except for an urgent request to cancel all appointments of that forenoon. An “emergency conference call” will take place instead. The news that is brought in that call makes the IT consultants gasp for breath. A piece of malicious software has been found on the network of BICS, a daughter company of Belgacom. It is hard to grasp even for well-informed insiders. The BICS network is so wide and deep that it is promptly clear to everybody that this is not just a Belgian problem. This problem is at least of European proportions. Because whoever controls BICS, controls the communication of a large part of the world. “This could have been larger than 9/11”, says one source who closely followed the case. Without a grain of irony. The pressure on the teams of the Dutch digital defender Fox-IT, that started cleaning up together with an army of Belgacom employees last weekend, was enormous. It was their second attempt, various sources confirm. A first attempt to remove the villainous software from the infected computers at Belgacom in the last weekend of August was cancelled. “At the time, not all conditions were met required to remove everything at once”, it was said. Some computers turned out to run the alternative operating system Linux, known of the penguin logo, not Windows. “The risk was too big that we could not remove everything at once. In that case you should not touch it. Or the adversary will know that the virus has been found”, states someone politically involved. The investigation of the hacking started on July 19th, when Belgacom went to court. During their work, investigators at the intelligence services, police and justice were very wary of a leak about the entire operation. In early September they informed the Belgian cabinet on strict conditions: the list of attendees of that meeting was kept closely. If a politician would have wanted to reveal the news before the malware was dealt with, the investigators would press charges for breach of confidentiality of the investigation. “We could not risk everything going wrong due to someone talking”, it is said. Belgacom was not infected with some common viruses, but with very professional malware that costed lots of money to develop. “We had to re-invent ourselves to do this”, an investigator said. “In other investigations there is a fixed idea of where you’re going, but in in this case it was continuously starting over because it was so difficult to get a grasp of the malware”. Gradually it became clear that the hackers are not only interested in the communications in the Middle-East, where BICS holds a solid position via South-African minority shareholder MTN. “They have been looking around and took what they could”, state sources involved in the investigation. They are clear about one thing: the attack originated from the United States. “We determine that by the signature of the malware, but especially by where the trails lead. They partially run through the UK. We think the US is the main destination. And the past weeks at the US Embassy, you notice some embarrassment when you request exchange of information.” Yesterday, the German weekly magazine Der Spiegel reported that the UK intelligence service GCHQ (Government Communications Headquartes) are responsible for the attacks. It based that claim on slides disclosed by whistleblower Edward Snowden. The news that GCHQ is behind the Belgacom attack is a surprise to at least the services working on the affair. Perhaps it wouldn’t hurt to make that drawing. BICS calls itself a “wholesale carrier”. Two words, four syllables, but behind it is a network that spans the entire globe and the beating heart of which is located in our capital, Brussels. BICS provides the hardware infrastructure that carries internet traffic, phone conversations, text messages and mobile data of telecom companies and government institutions. And the more sensitive the customer, the more likely he is the end up at BICS. The daughter company of Belgacom markets itself with the argument that they never ever look at what travels over its cables. “We provide the cables for you, and you just send whatever you want over them”, is what it basically boils down to. A governmental source points out the consequences of even a limited disruption of phone communications and internet. “If a crisis occurs, what is the first thing a human does? Grasp their phone. Imagine that that lifeline is lost. Not just for you, but also for the emergency services, hospital, the fire department…? And for the police? At first glance it isn’t, because they use the Astrid network [a Belgian national radio communications network intended for emergency services]. But that network only works apart from BICS for local communications. For interregional communications it is just as dependent on BICS as the rest. Hence, it is no coincidence that police chief Catherine De Bolle started looking for a backup for the communications system of the federal police on that Friday the 13th, just before the big cleaning operation would have started. After De Standaard brought the news of large-scale hacking at Belgacom, it turned out that the Ministry of Foreign Affairs and the cabinet of the prime minister had been hacked. “And this is merely the top of the iceberg”, states a source who was involved in the problems at Belgacom. Because telecom is one thing, but there are many other critical sectors that are the fundament of a country. Transportation, for example. Trains, trams, busses, highways, airplanes, everything involves computer networks and everywhere one should be cautious for cyber attacks. The energy supply is another critical fundament. And last but not least: the banking sector of a country. Luxembourg has already contacted the Belgian cyberservices [?] 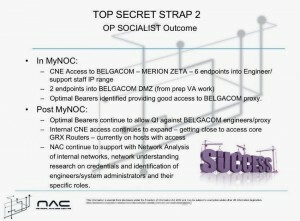 to obtain more information about the malware that hit Belgacom. What about ethics? Isn’t it schizophrenic that our country, Belgium, receives information about threats that the US or others have stolen from us? “That is the eternal paradox”, a recipient of such information states. Diplomatically it is the hardest. But if you receive information about a serious threat such as terrorism, you cannot ignore it. Then you have different things on your mind. Excellent! Thanks for adding that. Thanks for trying to keep your important article up to date by adding other links. Interesting story that has not gotten the attention it deserves since Belgacom is located in the same country as HQ of NATO and EU. Also important for it shows that state made APT’s do not allways come from the “list of usual suspects” (RF, CN, NK,IR). All cyber powers are engaging in this kind of dangerous activity.